Does a more fascinating insect exist on earth? The majority of today’s youth has no concept that without the honeybee, there would be no vegetables, fruits or flowers. They don’t understand that without vegetables, fruits and flowers, the animals they consume would have no food, and subsequently, couldn’t exist. They have never imagined a life without produce, a Valentine’s Day without roses or a breakfast lacking orange juice. Bee Buddy sits on the Ferris Apiaries porch, a common place for local conversation and entertaining. When we have visitors, they are not interested in sitting in our living room to find out what is on tv, they would rather sit outside, chat and witness nature’s miracle at work. Bee Buddy is truly captivating and we encourage any educator, with the means and approval, to look into having a Bee Buddy setup at their place of education. We can say without a doubt that our honeybees are mite free and have been carefully bred to be docile and strong; they are not interested in stinging onlookers. 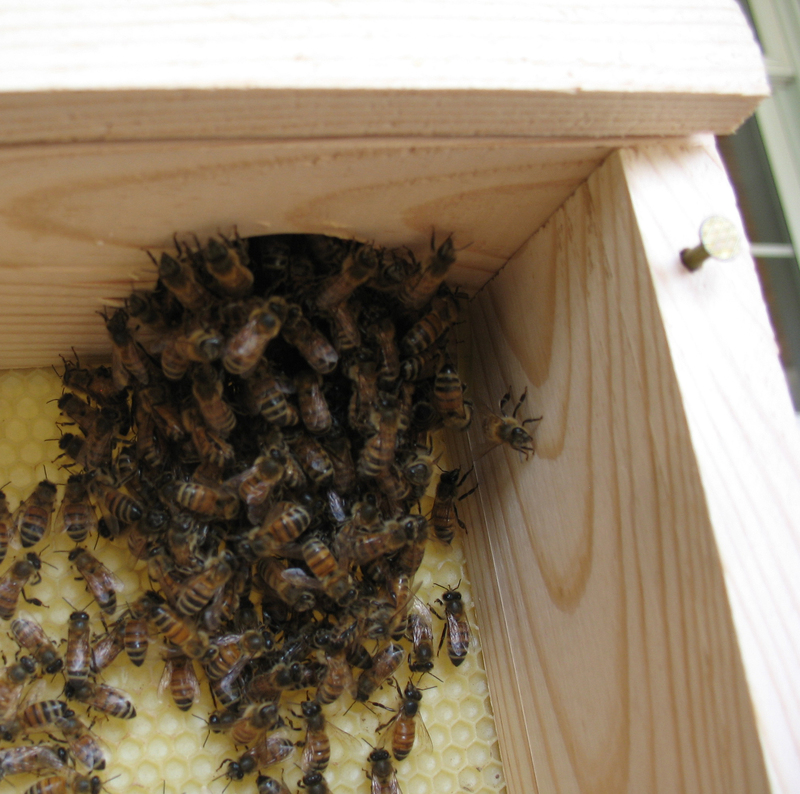 Within days of establishing a mini colony in our mini hive, the honeybees begin to build out the 1/8″ thick wax backing to their home. If allowed to forage, as opposed to only feeding from the included feeder, they will fill their honeycomb with the nectar found around their local environment. Students will be able to witness the honeybee ‘dance’ that lets the other bees know where to go to get more food. Can a more primitive form of communication replace the fascination with twitter? Only an educator can bring this concept to their pupils and we extend Bee Buddy to anyone that would like to bring the exciting and important life of the honeybee, into their classroom.